The Magnetic Field of Induction, Phi, is directly related to the magneto-motive force, or “current”, i, in amperes. A constant, time invariant, M.M.F. constitutes a constant, or “direct current”, magnetic field. This constant M.M.F., or direct current, gives rise to no reactionary Electro-Motive Force, E. E.M.F. is a result of the magnetic field acting to maintain a constant current in a regulatory manner. Here the current, and hence the M.M.F. are already constant, thus zero E.M.F. In this condition no energy is exchanged, thus the magnetic energy is “static”, or all Potential Energy, in Weber-Ampere.Since Electric Activity, or Power, in watts, is the product of this constant current, i, and an E.M.F., E, which is zero, the Activity, or Power is also zero. Thus in the absence of an E.M.F. no Power is required in order to maintain a static Magnetic Field of Induction, Fig 1A.Likewise, a Dielectric Field of Induction, Psi, is directly related to an electro-static potential, e, in volts. A constant, time invariant potential constitutes a constant, or “D.C.”, Dielectric Field. This constant potential gives rise to no reactionary Displacement Current, I, in amperes. Displacement is the result of the Dielectric Field acting to maintain a constant potential, but here the potential is already constant, thus the Displacement is zero. In this condition no energy is exchanged, thus the Dielectric Energy is “static”, or Potential Energy in Coulomb-Volts. Since Electrical Activity, or Power, P, in watts, is the product of this Constant Potential, e, and a Displacement Current, I, which is zero, the Activity, or Power is also zero. Thus in the absence of Displacement no power is required to maintain a static Dielectric Field of Induction, Fig 1B. A violent magnetic discharge, in the form of an intense forward E.M.F., results from the path for current, i, being broken, or open circuited. This forward E.M.F. is the result of the stored energy within the Magnetic Field acting to maintain a continuous current, and its M.M.F., which now has been disrupted by an open circuit. An open circuit is the denial of any current flow, thus an infinite E.M.F. is developed within the Metallic-Dielectric Geometry of the Inductance. Fig 1C. Likewise, a violent dielectric discharge, in the form of an intense Forward Displacement Current, results from the Potential, e, being Short Circuited. This Forward Displacement is the result of stored energy within the Dielectric Field acting to maintain a Continuous Potential which now has been disrupted by a short circuit. A short circuit is the denial of any Potential, thus an infinite Displacement is developed within the metallic-dielectric geometry of the Capacitance. Fig 1D. The Flow of Power, or Activity, is indefinite in all four of the above conditions. No products can be formed since it is either the current is zero, or the potential is zero. The energy involved is only that contained in the Fields of Induction themselves, no energy exchanged, or transfer, exists with outside forces. The static charge, or Transient Discharge must remain within the metallic-dielectric geometry of the Inductance, or the Capacitance. For the static case, the energy remains in a signal form, magnetic or dielectric. For the disrupted case, the energy escapes into its conjugate form within the Counter-Spatial Dimensions of the Inductor, or the Condenser, containing the energy involved. For the Disrupted Magnetic Discharge the extreme E.M.F., E, becomes an extreme electro-static potential, e, thus the energy escapes into Dielectric Form within the Inductor. 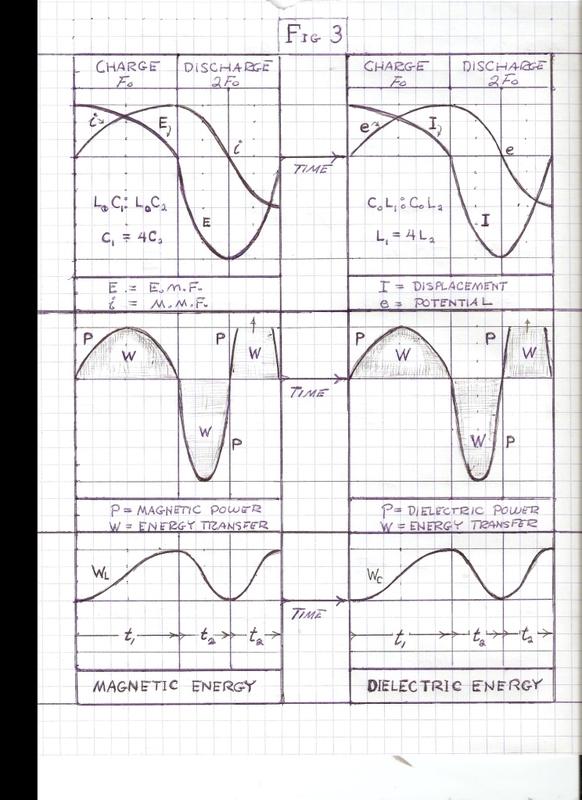 Likewise, for the disrupted Dielectric Discharge, the extreme displacement, I, becomes an extreme M.M.F., i, thus the energy escapes into Magnetic Form within the Condenser. Because no energy is dissipated, powerful electric oscillations are produced within the Inductor or Condenser. The trapped energy is continuously reflected to and fro between Magnetic & Dielectric Forms within the metallic-dielectric geometry of the device. Little Theoretical or Experimental knowledge exists on this subject, but here enters the work of Nikola Tesla, and his disruptive discharge apparatus. When the energy contained within the Fields of Induction is delivered to, or taken from, external forms, a set of relations exist as shown in Fig 2. This condition of energy transfer involves Electrical Activity, or Power, P, in watts. Power is The Time Rate of Energy Transfer into, or out of The Field of Induction. The Dimension of Time now takes part. 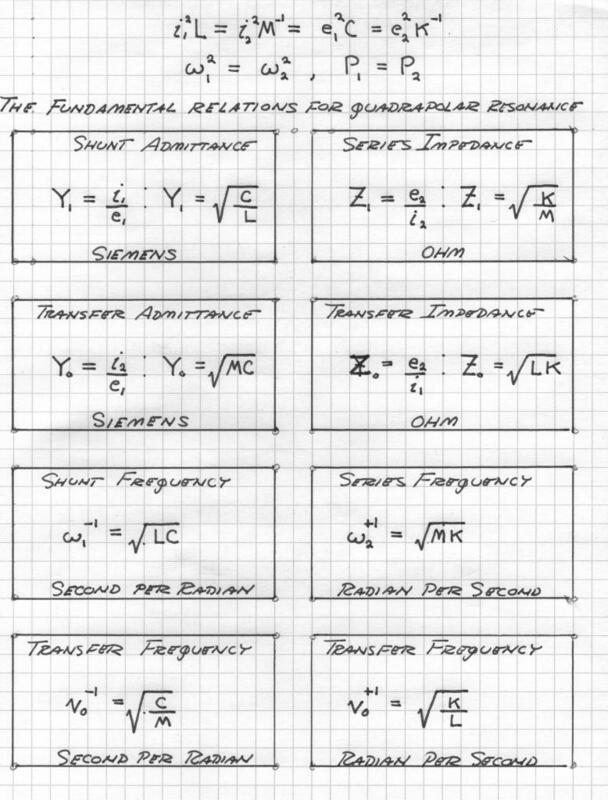 Thus energy transfer gives rise to Frequencies and Time Constants. The Polarity markings for eo and io are shown on the drycell in Fig 2. This unit drycell is hereby a source of Constant Potential to a Charged Condenser of Equal Potential, and a source of Constant Current to a Charged Inductor of the Same Current. The Displacement or E.M.F. is zero. In both conditions the energy is static, no Transfer of Energy takes place giving rise to Activity. The Power is zero thus the conditions revert to those of Fig 1A & 1B. This unit drycell contains a certain quantity of Stored Chemical Energy. This Chemical Energy can be taken out and delivered to an external form, or it can be given back to Chemical Form within the drycell, taking energy from an external form. Energy can be taken from or given to this unit drycell, it is rechargeable. This unit drycell thus can be a Negative Resistance, or a Negative Conductance, when supplying Energy to External Forms. It also can be a Positive Resistance, or a Positive Conductance, when taking energy from external forms. For the condition of constant current this unit drycell is a Positive Resistance, R, in ohm when taking in energy from an External Form, or it is a Negative Resistance, a “Receptance”, H, in ohm when giving out Energy to an External Form. Likewise, for the Condition of Constant Potential this unit drycell is a positive Conductance, G, in siemens when taking in energy from External Forms, or a negative Conductance, and Acceptance, S, in siemens when giving out energy to External Forms. And it is The energy stored within the Magnetic Field of Induction can be supplied to, or taken from the unit drycell. Likewise the energy stored within the Dielectric Field of Induction can be supplied to or taken from the unit drycell. Whereas the disruptive circuit condition completely open circuits the Inductance, or completely short circuits the Capacitance, here now the unit drycell is inserted in the place of the open circuit, or the short circuit. Circuit Continuity is hereby maintained by the drycell. Energy can now be transferred in a finite manner. (2) The Energy, W, in Joules, stored in the Dielectric Field, Psi, in Coulomb, is delivered by Electrical Activity, P, in Watts, Fig 2B, to the drycell. (3) The Energy, W, in Joules, stored in the Magnetic Field, Phi, in Weber is derived from the Electrical Activity, P, in Watts, Fig 2C, out of the Chemical Energy of the drycell. (4) The Energy, W, in Joules, stored by the Dielectric Field, Psi, in Coulomb, is derived from the Electrical Activity, P, in Watts, Fig 2D, out of the drycell. Hence Magnetic Power Flow in watts can transfer energy from the Magnetic Field, or to the Magnetic Field, this energy to, or from, the Chemical Energy of the drycell. The flow of power is two way, or bi-directional. It is a differential quantity. Likewise hence, Dielectric Power Flow in watts can transfer energy from the Dielectric Field, or to the Magnetic Field, this Energy to, or from, the drycell. Again the Power Flow is bi-directional, a differential quantity. The Magnetic Inductance develops an Electro-Motive Force, E, during the Time of Energy Transfer with the drycell. This E.M.F. acts in conjunction with, or in opposition to, the Continuity of Current (M.M.F. ), i, this developing the Electrical Activity, Ei, in watts, of Energy Transfer. This Activity, or Power, Pm, is the time rate of Energy Transfer. Likewise, the Dielectric Capacitance develops a Displacement Current, I, during the Time Interval of Energy Transfer with the drycell. This Displacement acts in conjunction with, or in opposition to, the Continuity of Potential, e, this developing the Electrical Activity, Ie, in watts, of Energy Transfer. This Activity, or Power, Pd, is the Time Rate of Energy Transfer. The longer, more prolonged, time rate of transfer, the less in magnitude is the Power Flow. Likewise, the shorter, more instantaneous, time rate of transfer, the greater in magnitude is the Power Flow. The Disruptive Discharge is a Limiting Condition, and as well is the Static Charge. In both cases the Flow of Power is zero. The Energy remains within the Inductor or the Condenser. 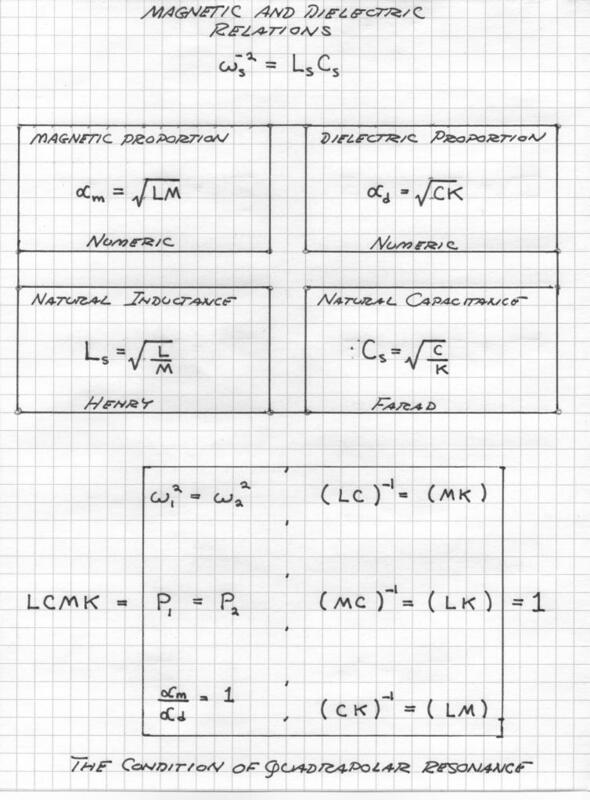 The factor n is called The Magnification Factor of Energy Exchange. While a Magnetic Inductance is gathering energy from the Chemical Energy of the drycell, a backward directed E.M.F., E, is developed within this Inductance. This E.M.F. acts to maintain a constant M.M.F., or current, i, that is it acts to maintain the quantity of Energy Stored within the Magnetic Field. While an Inductance is delivering its Magnetic Energy to the Chemical Energy of The Drycell, a forward directed E.M.F., E, is developed within the Inductance. This E.M.F. also serves to maintain a constant M.M.F. or current, i, that is it acts to maintain The Quantity of Energy Stored within the Magnetic Field. Fig 2A & 2C. Hence the charging Inductance, gaining Magnetic Energy, develops an E.M.F., E, in opposition to the Potential, e, of the Drycell. The resulting Voltage Difference combines with the current, i, in delivering Energy to the Magnetic Field of Induction. This E.M.F. is called the “Back E.M.F.”. Also, the Discharging Inductance, losing Magnetic Energy, develops and E.M.F., E, in conjunction with the Potential, e, of the Drycell. The Resulting Voltage Summation combines with the current, i, in delivering Energy to the drycell. This E.M.F. is called the “Forward E.M.F.”. The E.M.F. is thus a differential magnitude, Back E.M.F. on charge, +E, Forward E.M.F. on discharge, -E. Fig 3. Likewise, hence the Charging Capacitance ad Displacement Current, I, in opposition to the current, i, of the drycell. The resulting current flow combines with Potential, e, in Delivering Energy to the Dielectric Field, taking it from the Chemical Energy of the drycell. The Discharging Capacitance develops a Displacement Current, I, this in conjunction with the current, i, of the drycell, in Delivering Energy to the drycell, taking it from the Stored Energy of the Dielectric Field, Fig 2B & 2D. The Charging Displacement is called the “Back Displacement,” and The Discharging Displacement is called the “Forward Displacement”. Back Displacement, -I, Forward Displacement, +I, the displacement is a differential magnitude. Fig 3. Note, the unfortunate condition exists that the Production of Energy is taken as a Negative Value, the Consumption of Energy is taken as a Positive Value. However, this is the established convention, despite the confusion it creates. The versor expressions for charge and discharge are given as. Where, N = 0,1.Break, more to follow. In part one the energy transfer was one only of two forms, the transfer of Magnetic Energy, or the transfer of Dielectric Energy. Only one form of Inductive Energy exists. It is a single energy, and accordingly it is called a Single Energy Transient. Only one form of stored energy is active in a Single Energy Transient. Because these stored energies are static quantities, they are time invariant. The dimension of time has no role in their existence. It is however that time is a necessary dimensional requirement for the existence of energy. So where then is the energy? These dimensional expressions for stored energy represent only the Potential for Energy Existence. It is that the expressions given for the energy stored by a field of induction are no more than expressions for the magnitude, and quantity, of the magnetic induction, and dielectric induction, themselves. No union of the two inductions exist to form the product, Electrification, Q, and its time rate, Energy, W.
Each Versor Activity, or , represents one form of energy only, magnetic or dielectric, not both. By the Law of Energy Conservation for the stored inductive energy, the amount of energy given to the field must equal the amount of energy that the field can give back. This is to say the energy sent into a field of induction is the same energy sent out of the field of induction. Hence the two energies are in opposition with regard to the flow of power, the power in, and the power out, this resulting in a negative transfer constant, the magnification factor, n.
This results in the expressions for power flow containing a negative dimension, now exists one power flow forward in time, and another power flow, reverse in time. Power can now flow in both directions with regard to the dimension of time. Hence Power is free to move about in the dimension of Time, that is, it is a Versor Power Flow. Here exists an analog of power flow in space along the length of a transmission line, where power is free to move along the length of the line in either direction. Thus the analog of a “Length of Time”. Here then the existence of forward and reflected waves in time, just as was seen for waves on a transmission line. Hereby a composite transient, the superposition of a wave moving forward in time and a wave moving backward in time, can be developed for any instant in time. One wave travels from the past to the future, the other wave travels from the future to the past, a pair of traveling waves in time, traveling in opposite directions. The superposition of the opposing waves is the Present, or Now, t equals zero. – t , imaginary time, seconds. In part one the unique condition of a disruptive discharge was given. In the disruptive discharge of a magnetic field of induction, or a dielectric field of induction, the discharged energy is confined within the metallic-dielectric geometry. No external energy transfer exists. In this condition the given field, the magnetic, or the dielectric, exchanges its energy with its Conjugate Form, the dielectric, or the magnetic. This is to say that Every Condenser has a bit of Inductance, it is the very nature of an aether filled metallic-dielectric geometry. And L is the Parasitic Inductance. Because one form of energy storage is the denial of the other form of energy storage, in the disruptive discharge, no steady state condition is possible. The energy has nowhere to roost, it is continuously thrown back and forth, remaining within the metallic-dielectric geometry. Here the stored energy is continuously exchanged between spatial and counter-spatial forms of energy storage, this continuously moving back and forth thru time and counter time. Because the Inductance in the steady state is a short circuit, it cannot maintain a potential, e, and because the Capacitance in the steady state is an open circuit, it cannot maintain a current, i. Thus a potential, e, can only exist as a time variant E.M.F., E, and likewise a current, i, can only exist as a time variant displacement, I. Instead of allowing the disrupted Field of Induction to discharge back into its conjugate form within the metallic-dielectric geometry, an external conjugate form can be utilized. That is to say, an External Condenser, or an External Inductor. Equations (19) and (21) now apply to the external energy storage element rather that the internal parasitic values. These represent the natural impedance of the pair of energy storages. 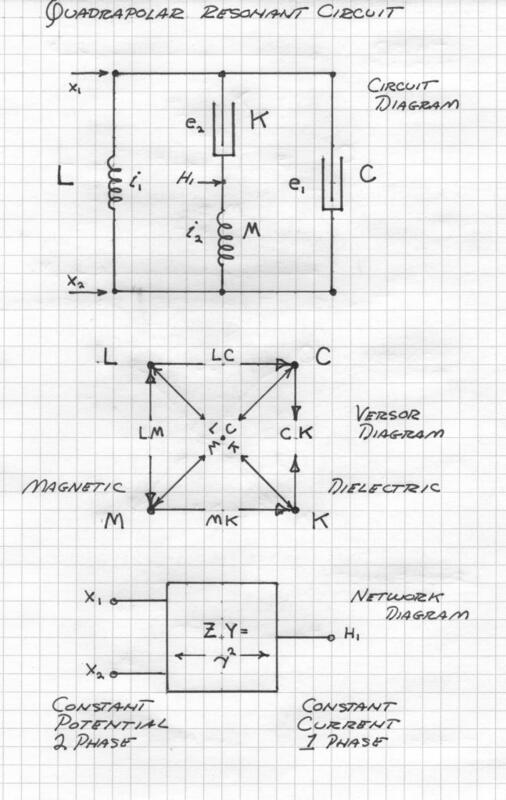 The metallic-dielectric geometry now is reduced to a magnetic inductance connected with an external condenser, or it is reduced to a dielectric capacitance connected with an external inductor. This is given in a sequence of diagrams, Fig 1. (1) Fig 1A. 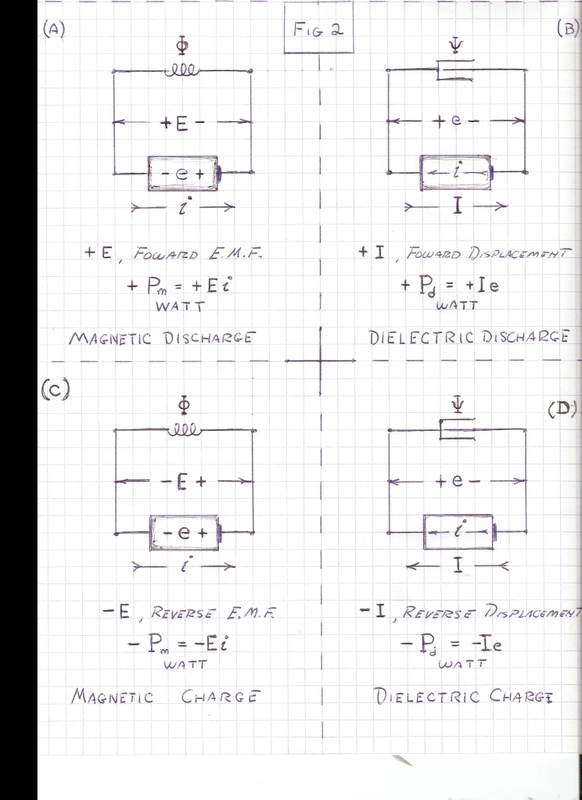 A discharging Magnetic Inductance transfers its energy into a Charging Dielectric Capacitance. (2) Fig 1B, A discharging Dielectric Capacitance transfers its energy into a Charging Magnetic Inductance. 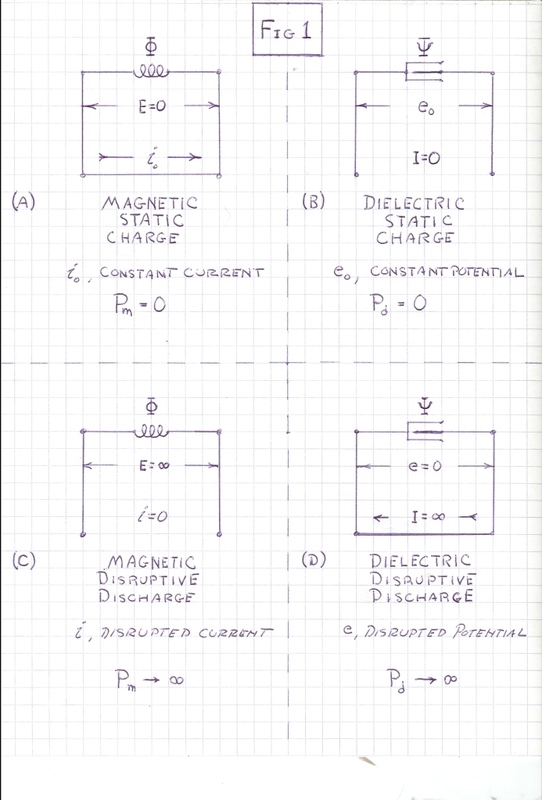 (3) Fig 1C, A charging Magnetic Inductance transfers its energy out of the Discharging Dielectric Capacitance. 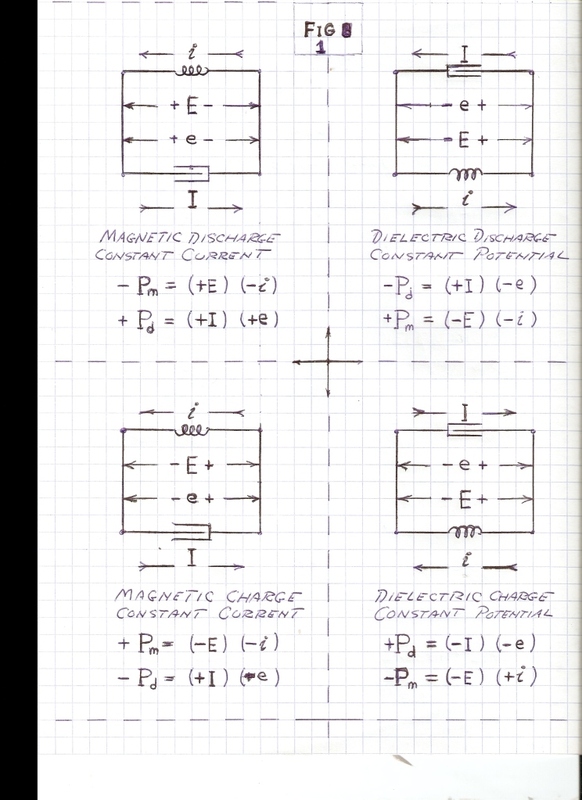 (4) Fig 1D, A charging Dielectric Capacitance transfers its energy out of the Discharging Magnetic Inductance. Here given are the four quadrants of energy exchange between a pair of mutually conjugate forms of energy storage, the inductor and the condenser. The stored energy is being continuously transformed from one form into its conjugate form in an endless cyclic rate. The time rate of this energy exchange is the electric activity, , in volt-amperes. This activity represents the flow of power between the Inductor and the Condenser. Rather than a single energy transfer, it is now a pair of energy transfers. This is now a double energy transfer, or a Double Energy Transient. In the double energy transient the stored energy is trapped with no escape. Thus this energy remains stored energy in an alternating current form, stored A.C. energy. The activity, or the flow of power is a continuous cyclic energy exchange, an opposing pair of energy transfers each moving in opposite directions in time. One energy transfer travels forward in time, the conjugate energy travels backward in time. The superposition of this opposing pair of traveling waves in time gives rise to a stationary wave in time. 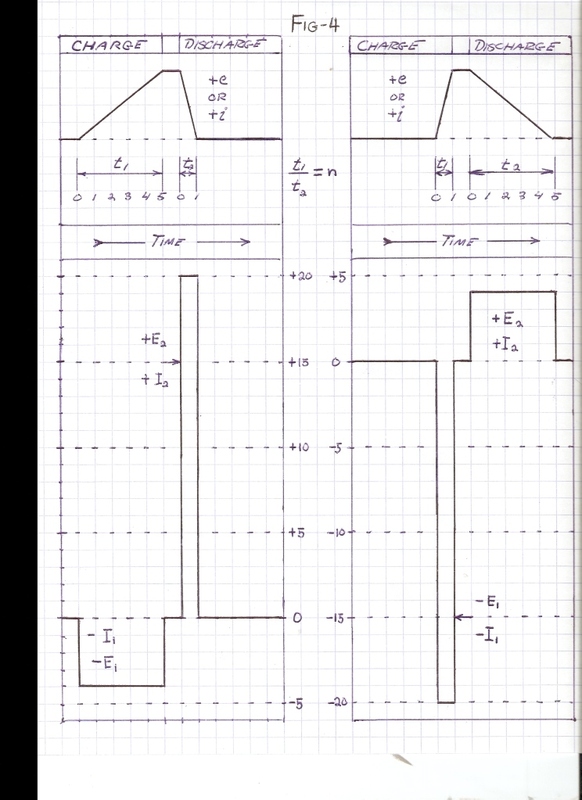 This is an analog to the standing wave on the length of a transmission line. The expression of the Law of Energy Conservation. The two time spans, the charge time span, , and the discharge time span, , are now equal and opposite. Hence a single time span can represent both and . Hence the magnification factor is always unity. The Magnetic Power, Pm, is equal to the Dielectric Power, Pd. This is to say the Charge Power Flow is equal to the Discharge Power Flow. No charge-discharge magnification exists here. This magnification factor is now just a versor operator establishing the Law of Energy Conservation. For the condition of energy transfer, the single energy transient, the transfer of energy is into, or out of the single stored energy. It is a one way flow, backward flow, or forward flow. It is uni-directional like a direct current. However, for the condition of the double energy transient the energy is reflected back upon itself between an opposing pair of energy storages. The double energy transient is a bi-directional power flow like an alternating current. The single energy transient can be considered a traveling wave in time, the double energy transient can be considered a standing wave in time. This is in analogy to traveling and standing waves on a transmission line. Here time is an analog of length in the movement of electric energy. 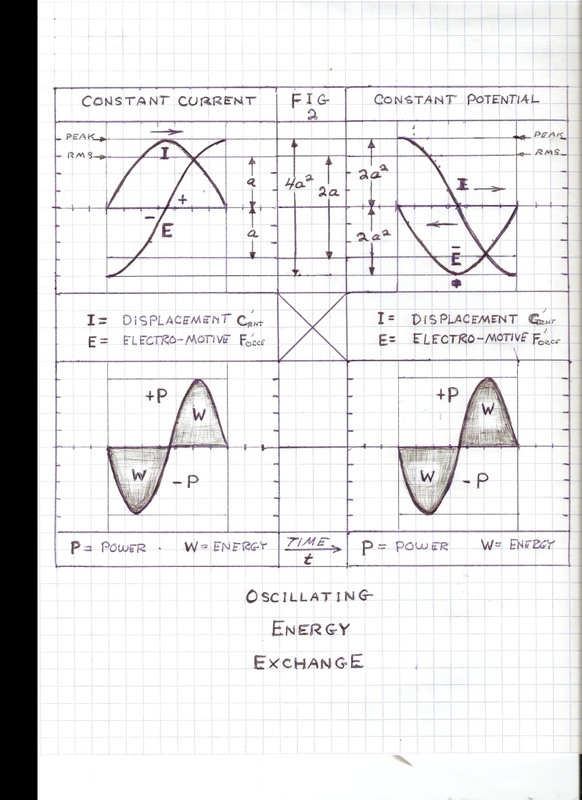 This is the electric activity of the oscillatory energy exchange between the Inductor and the Condenser. This is not an actual power in watts, but an electric activity in volt-amperes. eI , iE , watts. Where T is the time span of one cycle of energy exchange. This exchange is then in the form of a perpetual motion which gradually weakens due to energy leakage, that is, the losses in the metallic-dielectric geometries where the energy exchange takes place. Hence (42a) , by definition. Where, F, is the frequency of oscillation, in cycles ( radian) per second. Hence the magnification of activity for a given quantity of energy in the oscillating energy exchange is not a function of the ratio of charge to discharge times, since they are now equal. The magnification is here given as a function of the rate of energy exchange, the Frequency of Oscillation, F, in cycles per second. The more rapid the energy exchange, the higher the frequency and thus the larger the magnitude of the resulting electric activity. Power is directly proportional to frequency. Where is the angular time rate of charge and is the angular time rate of discharge. This magnification was utilized by Nikola Tesla for the purpose of Power Amplification with no electronic elements. The other method of altering the charge/discharge cycles is thru synchronous Parameter Variation. Rather than switching the energy storage elements, the co-efficients of energy storage, L, and, C, can be made variable throughout the cycle of Alternating Energy Exchange. 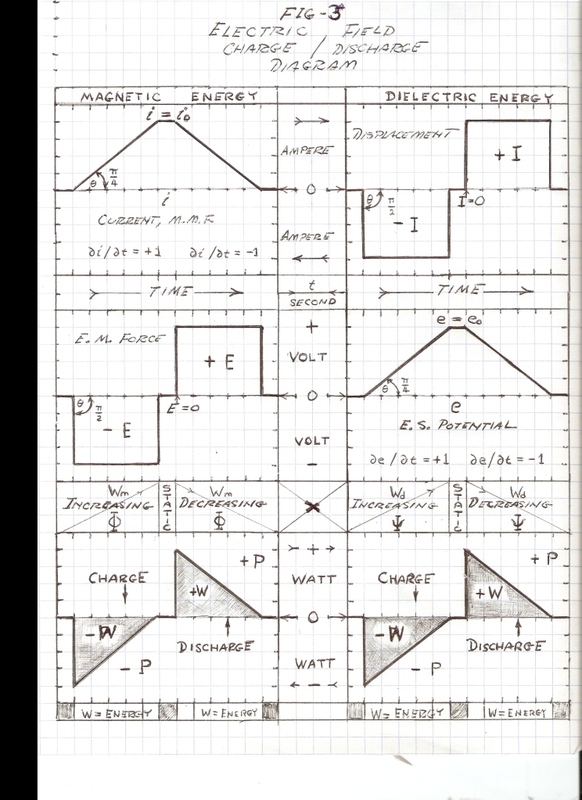 Hereby the capacitance can vary between charge and discharge intervals, or the inductance can vary between charge and discharge intervals, and both can be varied throughout the cycle of alternating energy exchange. The magnification factor is now a complex quantity, or versor expression. Little theoretical knowledge exists on this subject. Equation (49) states the Law of Energy Conservation, this for the condition of switching energy storage elements. Since the magnification factor is a complex quantity for the condition of Synchronous Parameter Variation, the Law of Energy Conservation is indeterminate. The relationship between Energy and Power is Time. The energy has been a stored energy, and the power has been the time rate of the stored energy movement. What has not been considered thus far is the condition of an actual Direct Current, a Time Invariant Condition, nor the condition of negligible co-efficients of energy storage, very insignificant values of inductance or capacitance. These are conditions of Zero Energy Storage. The dimension of time has no role in these conditions. This is the “Time Scalar” condition. Here is the fourth and final condition in the Flow of Electric Power. In the scalar condition the transfer of energy exists with no form of energy storage, there is no charge or discharge interval. The transfer is constant. As it was in the beginning, so it shall be for now and ever more, the continuous, or Direct Current. Even with the application of an alternating current, the energy transfer is still direct, it following exactly the cycle of the applied alternating current. Hence the scalar condition is FREQUENCY INDEPENDENT, as would be expected for a time invariant condition. Thus the transfer can be instantaneous. Time does not exist in the scalar condition. The notions of constant, cyclic, or instantaneous, play no part in this condition. They can only arise from external causes. 2) Negligible energy storage so as not to react with time variant currents, as with transient current. In both conditions the Electro-Motive Force, E, and the Displacement Current, I, are zero. Hence no energy exchange or transfer exists with any field of induction. This is to say that the time span is indefinite. Hence energy can only be expressed as power in the time scalar condition. So where then is the energy? In the scalar condition all energy is created and dissipated in the same instant, no intermediary energy exists. It is “on demand”. Obviously, as with the similar situation of the disruptive discharge condition, there is always a bit of something somewhere that leads to a determinate solution, such as the connecting wires. The actual scalar condition can only exist within inter-molecular dimensions. The scalar condition can be derived by the interconnection of resistances and conductances. 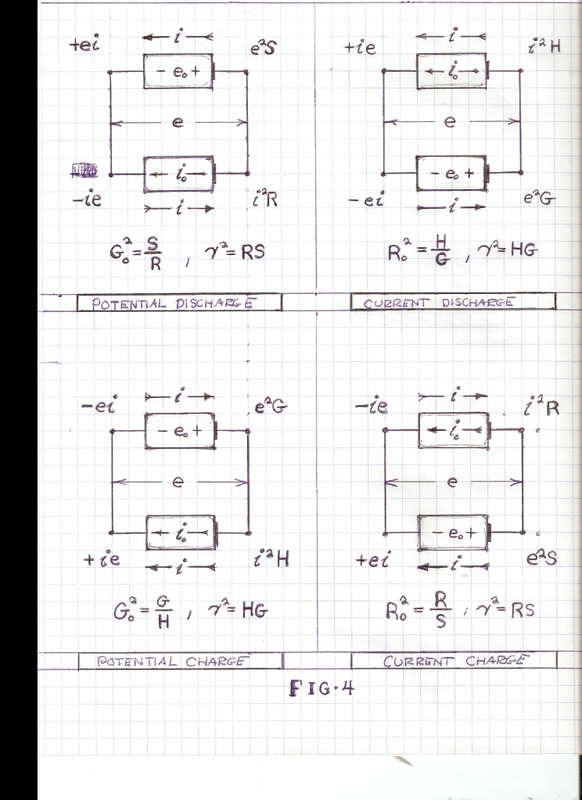 Resistance, R, in Ohms, and Conductance, G, in Siemens. No energy storage is possible in these elements and thus they are Time Invariant quantities. There is no energy, what ever energy is given here instantly vanishes, appearing as a source of heat. This scalar condition thus contains no electricity, it simply eliminates it. The rate at which energy is eliminated is given as a flow of power, P, in watts, this as a product of a dissipative E.M.F. and a dissipative displacement. The scalar condition can also exist for the interconnection of receptances and acceptances, receptance, H, in Ohm, and Acceptance, S, in Siemens. Here the energy is instantly produced, drawn out of the inter-molecular dimensions of the receptances and acceptances. With the resistance-conductance configuration the energy is instantly destroyed, pulled into the intermolecular dimensions of the resistances and conductances. Both are instant, no lag time is involved. These conditions can be established with a pair of unit drycells. This condition involves time invariant energy transfer. It is instantaneous. When a charged unit drycell is connected with a discharged unit drycell a constant unidirectional transfer of energy takes place. This transfer is in space, not in time. This transfer takes place from the charged drycell to the discharge drycell, a one way trip. Both are real quantities and thus algebraically additive. The volt-amperes represents the complete storage of energy with no leakage whereas the watts represents the complete absence of energy storage with the complete leakage of energy. Here “leakage” is defined as leakage into, or out of, the metallic-dielectric geometry. It can be seen that each quadrant is in itself another four quadrant relation. One relation is compounded with another. The versors are inordinately complex, back to the J. S. Bach. These relations given are found in “The POWER of Music, Alexander’s Feast”, by G.F. Handel, The Final Choral Movement. Consider this required listening.